DELIVERED AUGUST 2019 Sorbus Aria (Whitebeam) 20-40cm Trees. Hostile Site/Coast Tolerant, Hard Wood, Avenue Tree. Why Buy Our Volume Trees? Our volume trees are plug plants which can be planted all year round. No rush to plant as roots are not exposed. Very easy to plant, little cultivation required and very high success rate. Plants do not "check" when planted so rapid early growth. Root plug contains both naturally occurring mycorrhizae and fertilzer. Growing containers eliminate root spiralling. 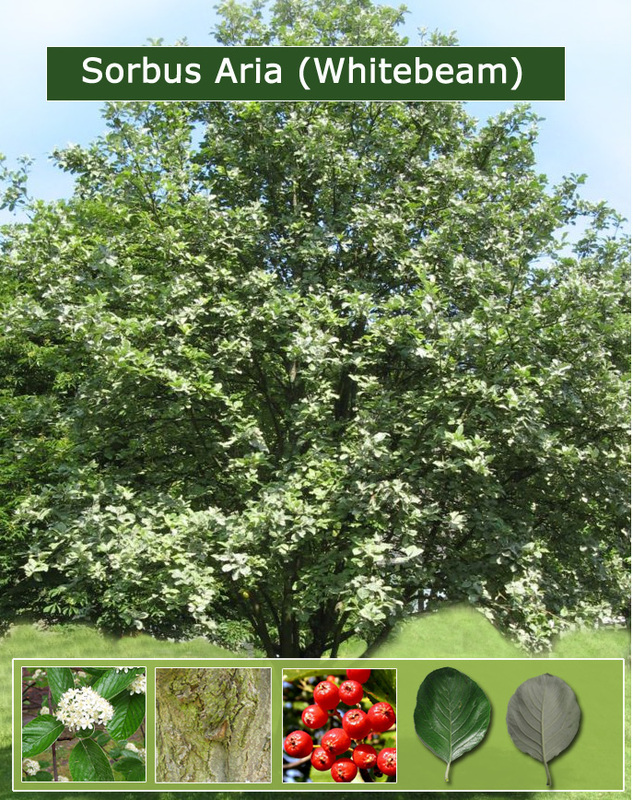 Whitebeam trees are deciduous, broadleaves, native to our country and can be grown in wet, dry, exposed, coastal and hostile sites but don’t appreciate the shade. It will reach a mature height of around 15-20m metres after 30 years or so. It has white five petalled flowers appearing around May to June time. Minimal pruning requirements but cut out crossing, dead or diseased wood. Deep crimson fruits in the Autumn for the birds. Suitable for coastal locations and public areas as they are long lived, pollution tolerant, robust and eye-catching qualities when mature. These features make them particularly attractive as an avenue tree. A tough and hardwearing wood making them ideal for cogs as parts of machinery before Iron was discovered, woodworking, furniture, tool handles etc . A deep orange wood when wet drying to a pale yellow. Bark is a Grey/Brown colour and quite smooth at a young age with leaves having a toothed edge and oval shape at 5-12 cm long. They have a silvery white look underneath caused by the white hairs (We have called this the Phillip Schofield look in the hope it will catch on). This makes the tree more attractive in the wind as the tree effectively changes colours from plush green to white and back again. The leaves can loose the hairs as it gets older. By October the fruits are ready having turned from green to red. They were used for making jellies for Venison but leave them for the birds, hedgehogs and squirrels, as they are sharp in flavour. A round head, and found in woods especially in chalk or limestone areas making them particularly suitable for Central, South and South Eastern England. It was “allegedly” (just in case there are still any around that might take offence!) named by the Anglo Saxons for its silvery white appearance. It has been used as a boundary or hedging tree in the past but not so popular these days. Our tree chart details which site conditions suit which trees and also which are evergreen or semi-evergreen. This is a task that can easily be over done. Any nitrogen based fertilizer will do such as 20:20:10 but the longer lasting ones which take 18/24 months are better as they are regulated by the weather and moisture therefore release slowly. If you are one of those lucky people that lead an eco lifestyle (VERY jealous if you are) and want to buy trees to burn, then maybe our wood burning chart (excel spread sheet) will help you decide. Ash, Eucalyptus Gunnii and Willow are worth looking at for their growth rates and calorific values. If you are looking to plant lots of plug plant or cell grown trees (the 10-40cm-ish) size range then maybe you should consider our tree planting tool. Tree planting rates of over 700 per day achievable. Honeysuckle (Lonicera periclymenum) is very attractive, fragrant and attracts more wildlife to your garden. A bit on the vigorous side but worth the effort. A great addition to your project. Broadleaf wood planting would be around 3m between each tree. Christmas tree planting for a commercial crop is around 1m. Too much/little water, animal Urine, excessive wind exposure (will slow growth), salt spray, frost on new growth, herbicide drift and over application of fertilizer. All our volume trees are UK grown and as far as we know because we have never caught one booking a holiday overseas.